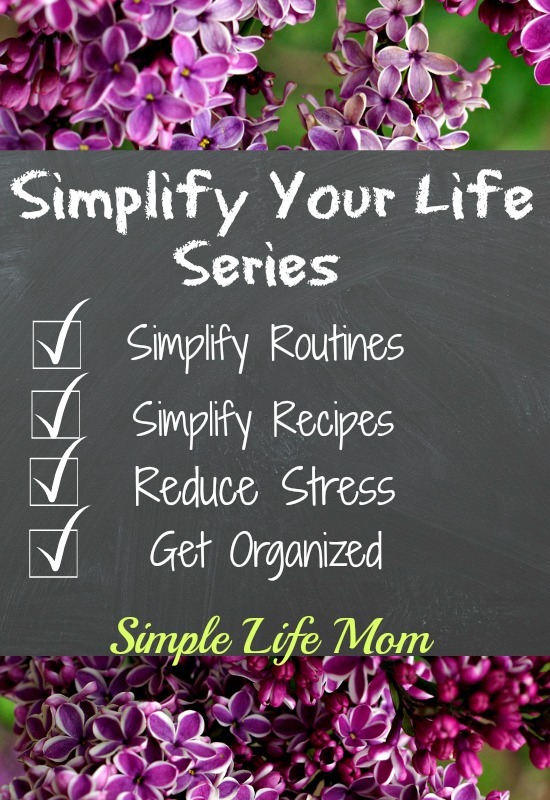 Welcome to the Simplify Your Life Series! We’ll simplify the kitchen by finding go to recipes and mixes to keep on hand. We’ll talk about things to keep in the freezer, things to get rid of, etc. We’ll walk through various rooms and discuss tips and tricks for keeping them organized and simplified. All of these will include recipes, free printables, some giveaways, and more! I’m really excited about all of these great ideas coming together! 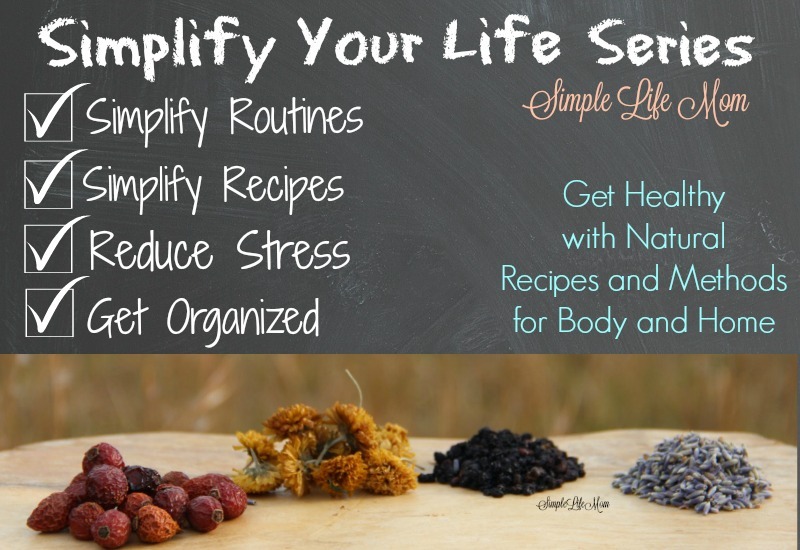 What is a Simplified Life? Simplifying ingredients in our foods and arranging our lives so that we have the time and resources to eat healthy meals. 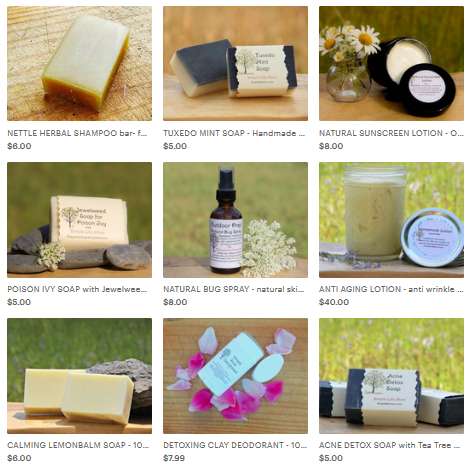 Simplifying ingredients in our home products and body products so that we are minimizing our interaction with toxins. Minimizing our possessions so that our lives are less cluttered and more organized. Simplifying our schedules so that we are less stressed and have more time to be organized, eat healthy foods, and spend valuable time with family. I’ve talked with so many people that feel that their lives are out of control. Their houses are a disaster and their kids are running the schedule. They live immersed in stress. My hope is that the recipes, tips, tricks, ideas, and other resources that I can give you in this series will ensure that you take a giant step toward a more Simple Life. Studies on the effects of stress demonstrate that excess or chronic stress upsets or hormone balance, compromises our immune system, increases heart attack risk by 21 fold, and can lead to depression, anxiety disorders, insomnia, type 2-diabetes, and more. (1) It’s a crazy domino effect on our system! When we simplify our lives, we are eating better, sleeping better, and are taking a huge chunk of stress out of our lives. When our lives are hectic, we often put off cleaning our house, organizing our cupboards, and making sure we are stocked up on necessities. Busy schedules and long work days can leave us with less time to be prepared. The next thing we know, our kids are asking for things we can’t find, husbands are complaining about a mess, and we can’t find what we are looking for (which often is the last straw for the evening sanity). When our schedules, kitchens, cleaning, and even beauty routines are simplified and organized, we are free to be more spontaneous and ready for what life throws at us. The push for more can seep into anyone’s life. We grow accustomed to what’s around us and think it’s natural for us to “need” the same. The next thing we know we are in debt and working long hours to try and make ends meet. When we seek to minimize our possessions, it is much easier to stay organized, feel that the house is clean, have what we need, and reduce stress. We then free up money to be used for more valuable things that last, things that create memories, like time spent together. When schedules get crazy, family time suffers. How many meals do eat eat together as a family with no tv or other distractions? Twice a day, once a day, once a week…less? Studies show that eating one meal a day together where you can discuss each others day leads to higher self esteem, lower teen pregnancy rates, and less drug abuse (2). If your life has been too crazy to sit down and eat with those you love, it’s time to make some changes. Everyone’s life is different. Even if we were under the same stressors, we will still respond to different areas of our lives differently. For example, I may become exhausted and therefore feel overwhelmed, where you may have tons of energy but feel disorganized. For this reason, you need to do some self examination and then utilize the resources that are provided for you. Use the Free Printable below to brainstorm where you need to simplify your life the most. This involves taking some quiet time to ask yourself some important questions. It can be difficult to pinpoint what exactly is causing your stress when you are underneath it all. At this stress level, everything from tiny responsibilities to the large important ones all seem to be the same in priority level and stress producing capability. It doesn’t make sense, but it is our natural reaction when under stress. Everything seems important, everything seems capable of pushing us over the edge. Yet, when not under stress, we are fully capable of prioritizing and dealing with the small every day stressors without letting them harm our peace. Keeping this in mind, try to determine which areas of your life are most important for you to get control of by simplifying and organizing. For example, if you are now a Veteran after having spend a large portion of your life in the forces, why not look into a cybersecurity career guide for veterans? It’s a career change worth looking into and you will definitely be learning something new. The Free Printable, HOW TO BEGIN TO SIMPLIFY YOUR LIFE, will help you walk through those steps so that as this series progresses you will be able to pay special attention to those areas and resources. I hope to hear from you! What areas are you looking forward to tackling in this series? Great post! I feel like a lot of us get so caught up in catching up that we’re always behind the 8 ball. An oz of prevention is worth a lb of cure. If we simply took time to sit down to plan and brainstorm for half an hour every week, it would save us so much running around and scrambling and panic. I love your recommendations. Thanks Lauren. I think it’s so easy to get caught up in day to day life where things just keep compounding. Taking a deep breath and prioritizing can make a huge difference. This is the road I am on already, and I’m looking forward to getting more help in simplifying. Wonderful Barbara! It’s great to hear we’re not alone in this. I do most of those things already, but it is good to get little reminders. Great post! Have a terrific week. This is great timing as I have been feeling myself sink deeper and deeper into overwhelm lately. Work has left me so emotionally and intellectually drained, and I can’t seem to stay on top of things at home. 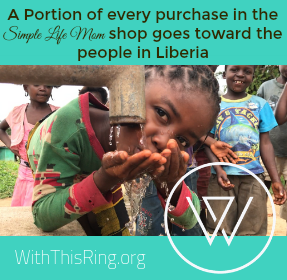 I was just thinking about the meaning of Simple Living – and how it’s not an end result but a journey, and something I have moved away from lately. Driving to work this morning, I was thinking of steps I could take to organize my home and prioritize my time – both of which always seem to help. I am looking forward to your series – thank you! Michelle, I’m so glad my timing is good. 🙂 We make simplifying our lives a priority, yet it is so easy to find ourselves going under with the stress of life. It’s defintiely a constant journey! This sounds like a great series, I’m all about keeping it simple and look forward to reading more! Thanks Joy. I hope it’s a help. I look forward to your series Kelly. I could use some help organizing my life. Finding a work/home balance has always been a problem for me. Working at home makes it even harder. I can’t wait to learn how you do it. I agree. I have three businesses working from home and I have to be VERY very intentional to keep life simple! Spring-time is the perfect season to de-clutter and get rid of stuff we don’t need or use. It always feels so nice when I purge closets and drawers. Great topic, Kelly! I definitely need some of this in my life! It is too complicated! Brilliant series and much needed in my life right now! Perfect timing, we’re in the middle a huge transition and part of our new life will be a more simplified home and life. We’re so excited! Thanks for the tips Kelly! Thank you for this wonderful encouragement to keep simplifying my life! Wonderful post and thank you! I really need to simplify my life, I’m working on it slowly but surely. I think I’ve done well simplifying my routine this year but I seriously need to work on the recipes! Stopping by from Wednesday Showcase and hope you linkup with us at Small Victories Sunday Linkup too, if you haven’t already. We’re open all week long! What can I say…I totally agree with every word that you have said in this post. The simpler, the better, indeed! It is something I am always aiming for and hoping to achieve consistency in.